I can't wait to see this! It's always out when I try to rent it. I'm in the middle of Kabhi Kabhie right now...sounds like there will be some interesting contrasts. The more I see of Shashi and Amitabh together, the more I like them as costars. I completely agree - they really did make a great on screen duo ('Deewaar', 'Do Aur Do Paanch', 'Trishul', 'Silsila'). I think 'Kabhie Kabhie' is an interesting film although vastly inferior to 'Deewaar'. What makes it immortal however is that 'Kabhie Kabhie' has one of the best soundtracks in Bollywood history, bar none. I am looking forward to your take on the movie however. 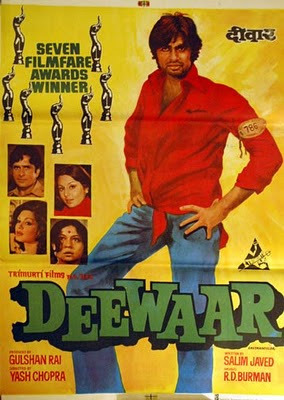 Sanket, I loved your comments on *Deewaar* - I completely loved the movie (can't wait to watch it again), but when I watch these classic movies I especially enjoy the comments of people who have held them close to their hearts for many years. The title song of "Kabhi kabhie" gives me chills - it was on the very first CD of filmi music I ever owned, before I'd ever seen a single Hindi film, and along with "Dum maro dum" and "Chura liya hai tumne" it was one of my first favorite filmi songs. Thank you for the recommendation, Sanket, sounds like an amazing movie. I've been trying to get a hold of it before but I haven't been able to find it yet. Now I really want to see it, though! As always, a very insightful and informative piece, Sanket! I recently watched this and loved it - I will be doing a review soon although between you and Carla, it's just about all been said! I feel quite pleased at myself for identifying the 'Mother India' connection all by myself while watching the film (haven't seen 'Gunga Jamuna' yet) - although I guess it was a bit obvious so my pride is rather misplaced. One question based on your closing quote: what were the 2 film scripts that Salim Javed wrote from one idea? Carla - I was thinking the same thinking but in reverse! That is always a thrill to me when these movies that meant so much to me growing up mean just as much to people from other cultures now. As far as 'Kabhie Kabhie' goes - every Desi person that I know of (whether they like Bollywood or were even born when the movie came out) is a fan of that soundtrack. DG - Can't wait to read your take on it because as I said earlier - I love hearing what people from different cultures have to say about the films I grew up with. Congrats on the 'Mother India' connection - I didn't get it until one of my (many) repeated viewings of the film years later. The quote was a bit confusing but I believe the 2 movies the writer was referring to was this one & 'Zanjeer'. Thanks Sanket - that would make a lot of sense - both main characters are haunted by their childhoods, both are angry... the difference is the channels through which they seek to exorcise their demons. Interesting fact about them being friends - I am sure that had alot to do with professional rivalry back in the day. These days they are quite friendly and speak fondly of eachother. I did love 'Shakti' as well - seeing Dilipji & AB on the big screen together was just amazing for any film buff! The lines in this movie are just all amazing but the Shashi line is the one that is truly the show stopper! Dear Sanket, wonderful comments on Deewar, and very apt too. 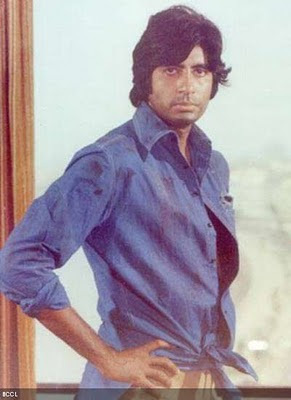 I wonder if you could tell me the details of the song "I'm falling in love with a stranger" which plays in the background during the Amitabh-Parveen meet in the hotel lobby. One friend of mine says it is Usha Uthup, while another says that it is Ila Arum. I think it sounds like neither.